Being a family of 4 — my husband, myself, my 9 year old daughter, and 11 year old son — going to the beach for the day was a complete “NIGHTMARE”. To say we traveled like “gypsies” is an understatement. We packed the cooler with food, 3 gallon thermos, boogie boards, umbrella, toys, CD player, blanket, chairs, towels, lotions, etc., etc., etc. It took the 4 of us two trips back and forth from the car to finally get settled. Recently, we purchased a Zoom Buggy® and this “AMAZING” product actually does all the work for us. We load everything into the enormous bag, turn on the variable speed control motor, and it will not only climb up and down stairs, it will effortlessly pull your entire load through the sand for you. The forward and reverse options come in quite handy as well. It also folds up very compactly for easy storage in your trunk or SUV. 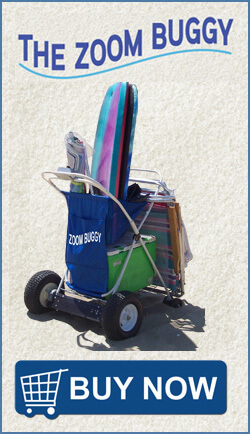 Thanks to the Zoom Buggy®, our trips to the beach will truly be enjoyable. I had been using a fairly common cart to transport all of my necessities for a full day at the beach. While the cart could hold a lot of weight — chairs, umbrella, water jug, lunch cooler, blankets, towels ‐ and was great on pavement, moving across the sand was another matter. It was like pulling a refrigerator across the beach. Then I tried the Zoom Buggy®, and the load moved like it was on a magic carpet. Push a button, hold on, and the motorized Zoom Buggy® does all the work. Truly, a miraculous machine. Now if they can only get it to load and unload all my stuff automatically. Mr. A. introduced us to his “Zoom Buggy®” last summer, and my husband and I think it’s the greatest invention around. At the beach it was able to hold a portable canopy with legs, 2 sand chairs, a collapsible table, a water jug, a food cooler, a beach back with towels, lotion, and other items, and a radio. With its motorization, it was able to go up and down stairs; at the beach with ease it “glided” through the sand with absolutely no exertion on our parts. Not only is it useful at the beach, but it has many other uses as well. Anytime you need to take a lot of things, the “Zoom Buggy®” is good. Fits great in the trunk of our car and collapses quite easily.